Dr. Sophia Tegart has led a varied and award-winning career as a flutist, musicologist, and clinician. A popular performer, she has been soloist with the Spokane Symphony, the Washington-Idaho Symphony, Chehalem Symphony Orchestra, and the Kansas City Civic Orchestra. As a Yamaha Performing Artist, Tegart has performed throughout the United States, Europe, and Asia. Competitive internationally, she was a finalist in the Mu Phi Epsilon International Competition and was quarter-finalist in the National Flute Association Young Artist Competition. An avid chamber musician, Tegart has performed at National Flute Association Conventions, the Florida Flute Association Convention, College Music Society conferences, and in collaboration with numerous museums. She co-founded the Cherry Street Duo and the Blue Box Ensemble, and has collaborated with the Portland Percussion Group. Her love of chamber music has also led Dr. Tegart to arrange works for small chamber ensembles, which are currently published by Audible Intelligence Music. Tegart won orchestral positions with the Oregon Mozart Players, Washington-Idaho Symphony, the Walla Walla Symphony, and the Des Moines Metro Opera. Additionally, she was guest principal flutist in the Kansas City Chamber Orchestra, and performed regularly with the Kansas City Symphony and the Portland Festival Symphony. Currently, Tegart is piccoloist with the Colorado Mahlerfest, and second flute and piccolo in Carl Fischer Publications’ premiere recording ensemble, the Tradewinds Wind Ensemble. A highly sought after pedagogue, Dr. Tegart regularly presents master classes, clinics, and lectures throughout the United States. She currently teaches at Young Musicians and Artists (YMA), and has served on the faculty of the Music For All Summer Symposium and Music in May. Prior to her appointment at Washington State University, Tegart served on the faculties of Pacific University, George Fox University, Concordia University-Portland, and the University of Idaho. Tegart’s research interests include nineteenth-century operatic mad scenes, representations of art and literature in music, and zoological elements in early twentieth-century French flute music. For her masters thesis, “An Instrumental Voice: Use of the Flute in Lucia’s Mad Scene,” she won the Mu Phi Epsilon Musicology Award. Tegart has also presented lectures about ekphrasis in the music of Jessica Rudman, specifically Anne Sexton’s Transformations, a retelling of Grimm’s Fairy Tales. 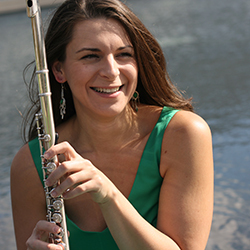 Dr. Tegart received her Doctor of Musical Arts degree in Flute Performance from the University of Missouri-Kansas City Conservatory of Music and Dance where she held the flute fellowship in the Graduate Woodwind Quintet. She graduated from the University of Oregon with a Master of Arts degree in Music History and a Master of Music degree in Flute Performance. An alumna of WSU, Tegart received a Bachelor of Arts degree in History and a Bachelor of Music degree in Performance and is thrilled to be back in Cougar Country!